Iceland, whose official name is the Republic of Iceland (Ísland : literally “land of ice”), is an island nation of the North Atlantic Ocean, located between Greenland and Scotland, northwest of Faroe Islands. It is located on the mid-Atlantic ridge separating the Eurasian tectonic plates and North America and has so many volcanoes. Geographically closer to the American continent via Greenland, the country is culturally and historically linked to Europe. The country has an area of ​​103,000 km2 and a population of approximately 320 000 inhabitants. Its capital and largest city is Reykjavík. Icelandic is the official language. Iceland is located on the edge of the Arctic Circle and the Mid-Atlantic Ridge. Its climate is extremely windy and rainy. The cover is thin and rare. Erosion is very high. The atmosphere is very pure in Iceland gives the photographs a special light. Hunt flowers and scenery with your camera lens. The volcanic nature of Iceland is constantly visible lava still hot, hot springs, craters, volcanoes, geysers, bubbling mud pots. There are many natural sites in the lake, you can see the pseudo craters at Skútustaðir, the stratovolcano Hverfjall, as well as hot springs and Grjotagja Storagja that were once used for bathing. A horse tour: this animal is remarkably resistant to harsh weather conditions. Even if you do not make your horse transport exclusively, pay yourself the luxury of a half-day horseback. An unforgettable experience. The Icelandic horse, which is not to be confused with a pony, knows no fewer than five different steps including the famous not Icelandic between walking and trotting, the equivalent speed advance without shaking trot. Snowmobiling on the glacier Vatnajökull in the south-east of the island. It is “lost” in the white immensity, is extraordinary. But you can also simply mount (as a special) on top of the glacier, the road to peak in the middle of the rubble with sea view is spectacular. A dip in the Blue Lagoon (blaa Lònið) south of Reykjavik. It is a lagoon formed by the discharge of the geothermal station nearby. The temperature of the mineralized water is above 35 ° C.
A trip to the whales in the Arctic from Reykjavik. Minke whales, humpback whales, dolphins and porpoises are the species that you see most often. 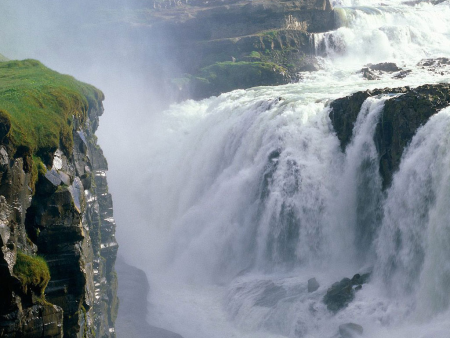 Gulfoss (Golden Falls) owes its name to the rainbow that covers in good weather. This double drop an altitude of 33 meters has an impressive water flow. Skogafoss: 60 meters high, 25 meters wide and falling vertically, this waterfall is considered one of the most beautiful in the country. Seljalandsfoss is close Skogafoss. Equally high (65 meters), it is less wide but if you do not mind getting wet you can make the turn. Glymur fall is the highest in the country with its 198 meters. It is not accessible by road: it takes one hour hike each way. The marked trail is wonderful: it first passes through a plateau and then down to the river through a cave. Crossing the river on a tree trunk is followed by a steep climb where the landslides on stone (do not create landslides!). ← Why Travel in Italy ?